As we speed towards the year that HTML5 will become an official recommendation, let’s take a look at the current level of browser support. Here are a couple images that we all need to be familiar with. 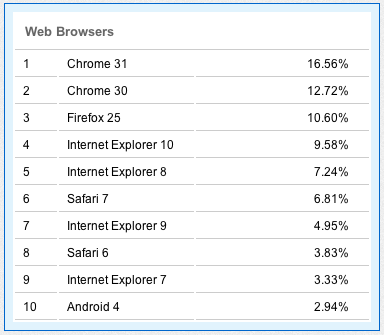 The first is from HTMLtest.com, a site that ranks browsers based on how well they support the HTML5 spec. The highest possible score is currently 555. While it’s great news that browsers that are highly compliant with the HTML5 standard represent nearly 50% of the market share, it’s troubling that browsers that are so far behind as IE9 and older still account for about a quarter of all browsers in use today. 1. Write all web pages in HTML5, according to the latest version of the spec. Browsers are continually getting better, and even the most late of late adopters are gradually graduating to better browsers. When you’re feeling down, notice the complete lack of a certain version of a certain browser from Microsoft on the above chart! HTML5 represents a major improvement to the web, and it holds the promise of reducing and perhaps even eliminating browser incompatibilities at some point. But, not just yet. In the meantime, however, it’s fully possible to support nearly every user of your site and to smooth over browser incompatibilities by using simple and free tools. So, why wouldn’t you? This entry was posted in Uncategorized on December 10, 2013 by Chris Minnick.